So this season's SIFF was fairly good, but I couldn't help thinking it didn't quite reach the heights of Spring's 2015's SIFF. Don't get me wrong, there were some excellent films - but there just weren't as many of them. I think the main reason for this was because quite a few Machinima Masters pulled out of the festival. I know there were about 3 or 4 that I was especially looking forward to, but sadly they were absent. I'm 90% sure at least two of them would've made my favourites list. Anyway, with that being said, here is a list of my favourites, and honourable mentions. A fabulous looking MEP and a great song. Gorgeous editing work by all. A story about odd happenings, this pilot drew me in immediately. It was mysterious and engaging the whole way through. The characters were well-written and it had some unexpected moments of humour. Only about two weeks until the Sims International Film Festival begins on the 15th September 2015! I'm not participating, but I'm looking forward to watching the submissions - there are a HUGE amount of films this season! I will be watching all Masters, Films, Music videos and MEP's and will be posting a list of my favourites a couple of weeks later. However, I will not be viewing series unless a few happen to fall into the Master category. Gonna be honest here , and I have stated this before, but I'm not really a fan of Sim's series - there are very few I like. While I respect the dedication that goes behind them, Sim Series just aren't my thing when it comes to SIFF. I didn't add the film grain & colour correction to mine, as I wanted it more colourful. Thoroughly unimpressed by the new Sims 4 EP trailer. This is a very old, unfinished project that has been stagnating on my hard drive for a couple of years. I was originally hoping to release it for SIFF 2013, but couldn't get it done before the deadline. I shelved this project for a while, but it got to a point where I couldn't bring myself to finish it, yet I couldn't bear to throw out all the footage, so in the end I thought I'd edit together what I had on hand and hope that it's at least semi-watchable. This is probably my last MEP with The Sims 3, I'm uninstalling my game and going to be making videos with another program for a while. 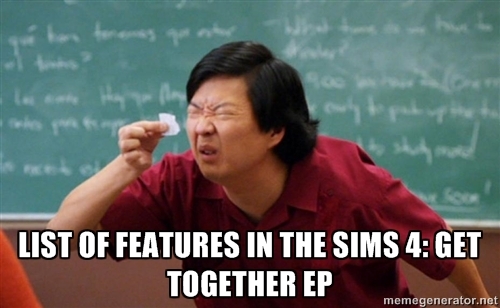 I don't like to say the word "quit"when it comes to The Sims 3, so I'm gonna call it an "extended hiatus". P.S. Still haven't bought The Sims 4. If an animation player is released... I might change my mind. But, the game still looks very mediocre to me. Machinima stuff and insane ramblings by Ballantyne.